Our little princess farmer awoke crying and screaming this morning. She was distraught as tears streamed down her face, wetting her tangled hair. I struggled to understand what she was saying through the sobs. She must have had a nightmare, her first nightmare. Stupid Halloween with all its witches and scary pumpkins and ghosts at every store and every house. We’d driven by a yard last week with bloody skeletons and zombies made to look like they were crawling out of graves in the grass. I hadn’t thought she’d seen it, but maybe she had. I sat on the bed and lay her chubby, raspberry-blowing baby brother next to her on the pillow. He rolled towards her sobs and began pulling on her hair (clearly out of concern). I scooped her up and asked her what was wrong. She took a few deep breaths and looked up at me. Then with desperate, terrified eyes she cried, “Ma took my chickens!”. “Ma took my chickens,” she insisted and buried her face in my arms. “Ma” is my mother. You know, the one who slaved over the beautiful Frozen cake for my little princess’s birthday. 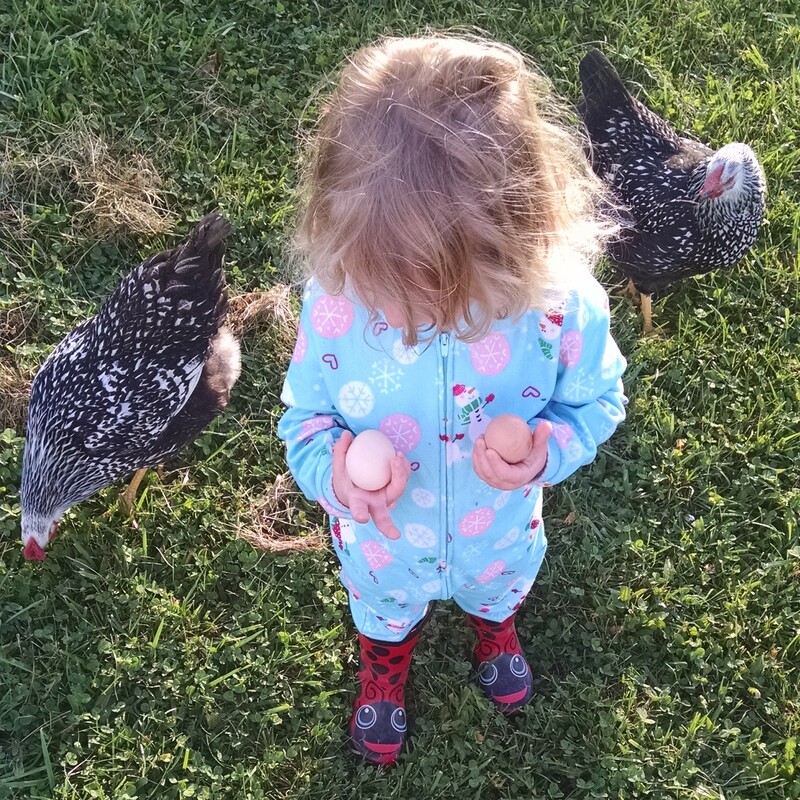 Who knows how my daughter’s subconcious had mixed and mashed chickens and a loving grandma and poultry theft into an early morning nightmare, but it had. Not having ever had a nightmare before, she thought the dream was real, a memory from an actual event. I tried to comfort her, explaining that the chicken thievery had not actually ocurred. I picked up her brother from the bed and went to her dresser for some clothes she could wear outside. As I pulled a pair of jeans and a T-shirt from the drawer, I heard the front door open. 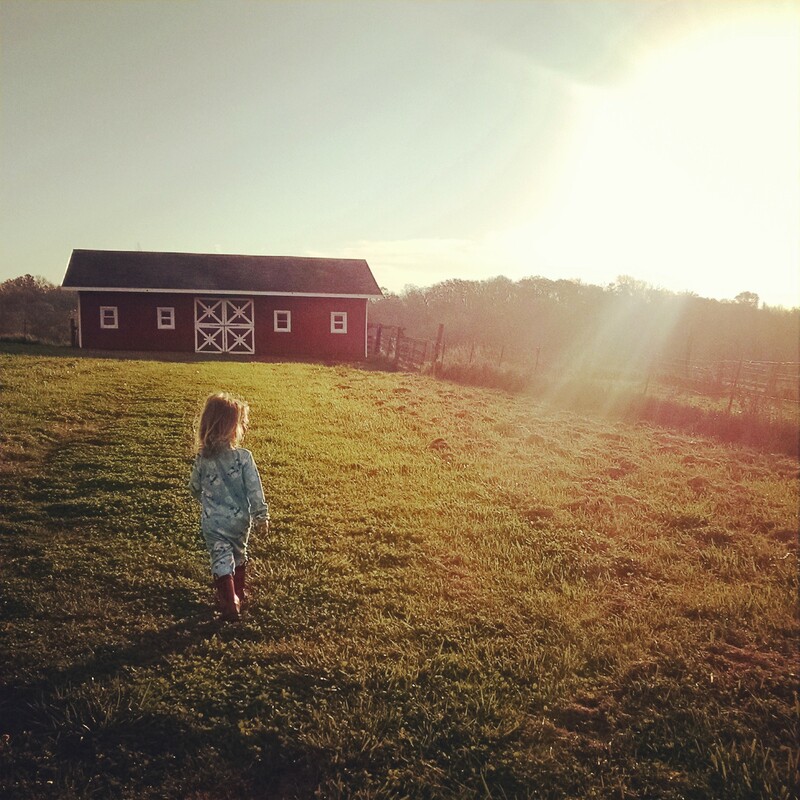 She had pulled her rubber ladybug boots over her footed Christmas pajamas and was halfway down the front walk towards the barn by the time I caught up with her. 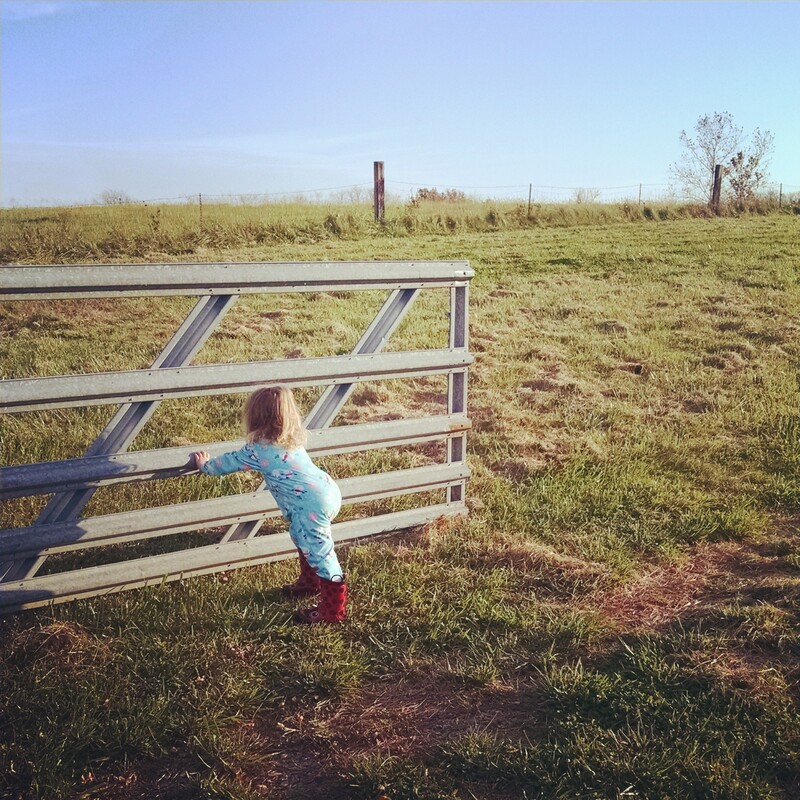 So, before coffee or bathroom breaks or getting dressed, we headed out to the barn. For late October, it was a warm morning. 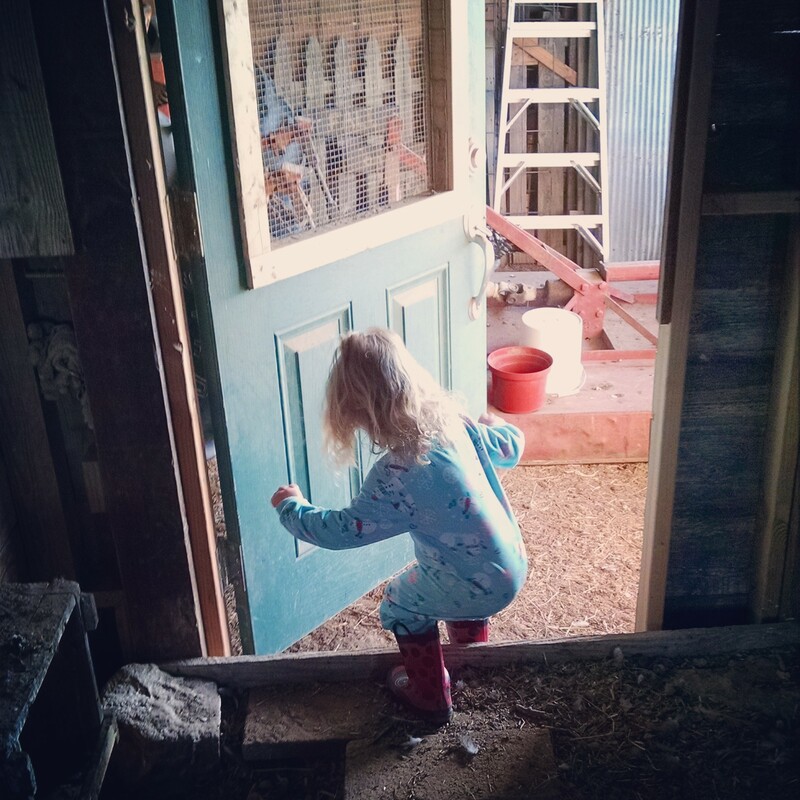 As she stretched to open a latch on the gate, her much-loved and supposedly stolen chickens scampered out of the coop to greet her. Relieved, she set about her chores cheerfully. 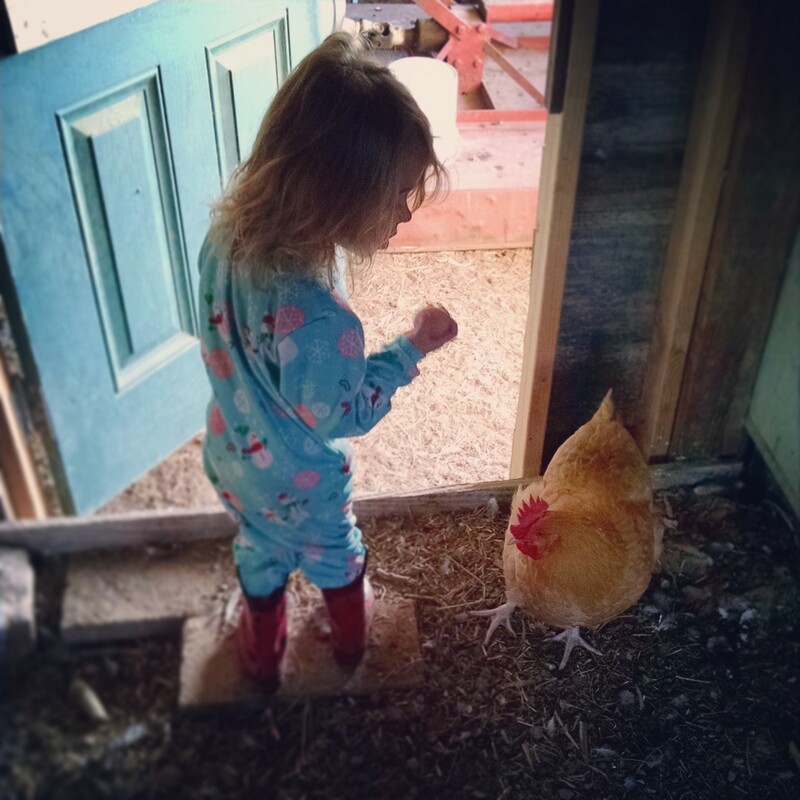 She fed them and after finding 2 eggs on the coop floor instead of in the nesting boxes, she lectured our largest Buff Orpington on proper egg-laying practice. And then, eggs in hand, headed back outside to chat with the other ladies. 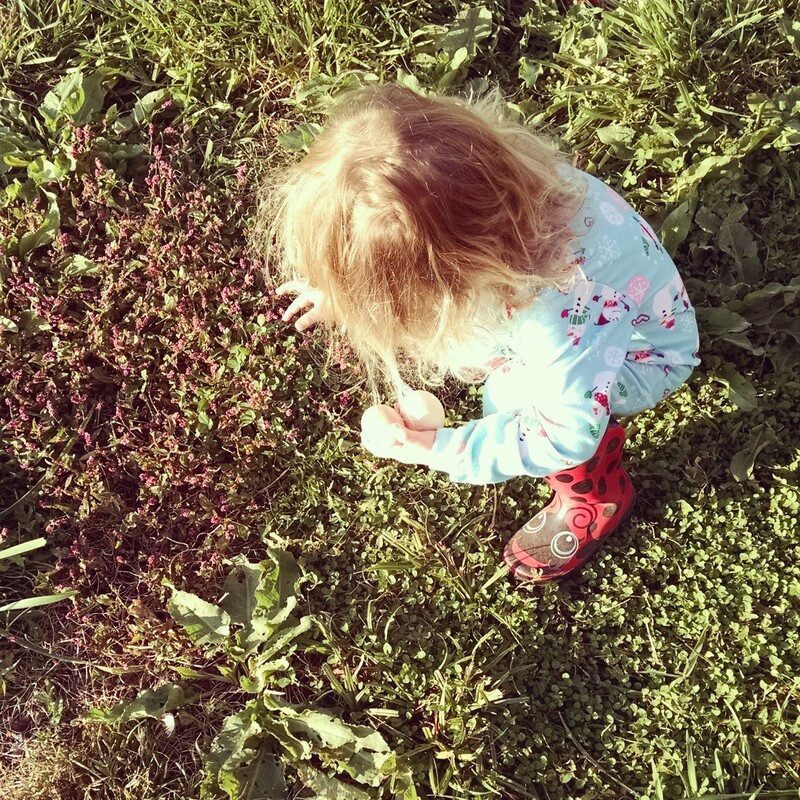 She picked them little pink flowers to eat and the hens were good sports as she chased them around trying to feed them her finds. 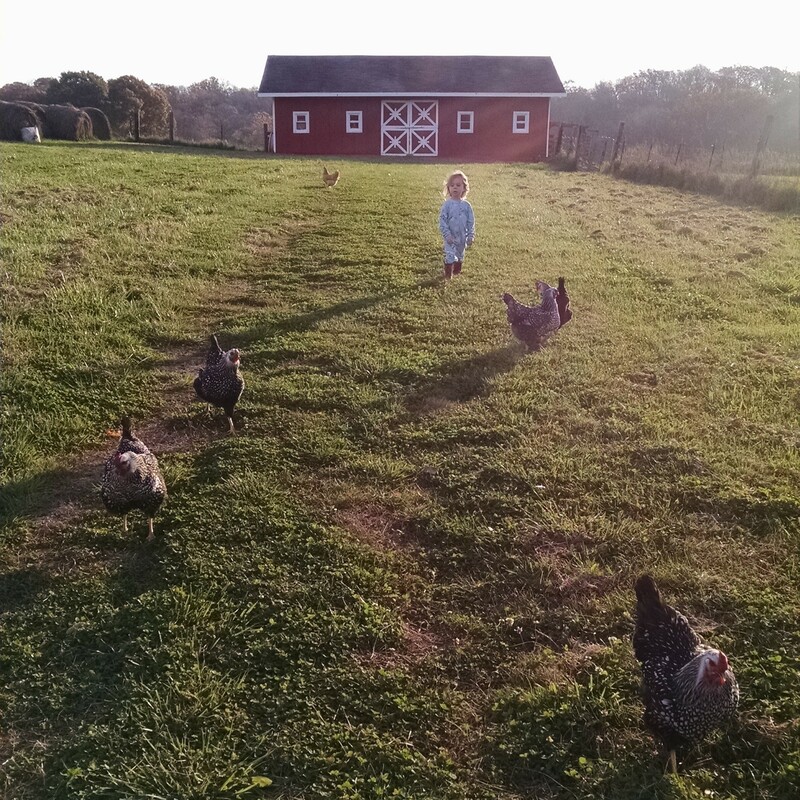 And then we headed back towards the house, chickens racing us through the grass. “What do you want for breakfast?” I asked her. Your post is just what I needed to read right now, after a busy day of work and the traffic of the city. You made me lose all the stress as I was walking with you all to the barn and back. Thanks. Glad it could help you unwind. A walk to the barn often has the same effect on me. Hoping the rest of your evening is peaceful. I remember when my daughter thought her dreams were real. Such sweetness. Beautiful post. Annie–I just saw an episode on “Little House on the Prairie” and Laura wondered who would ever be interested in her thoughts on the little house in the big woods…look how interesting her books and movie have been for all generations….just food for thought!!!! LOVE. 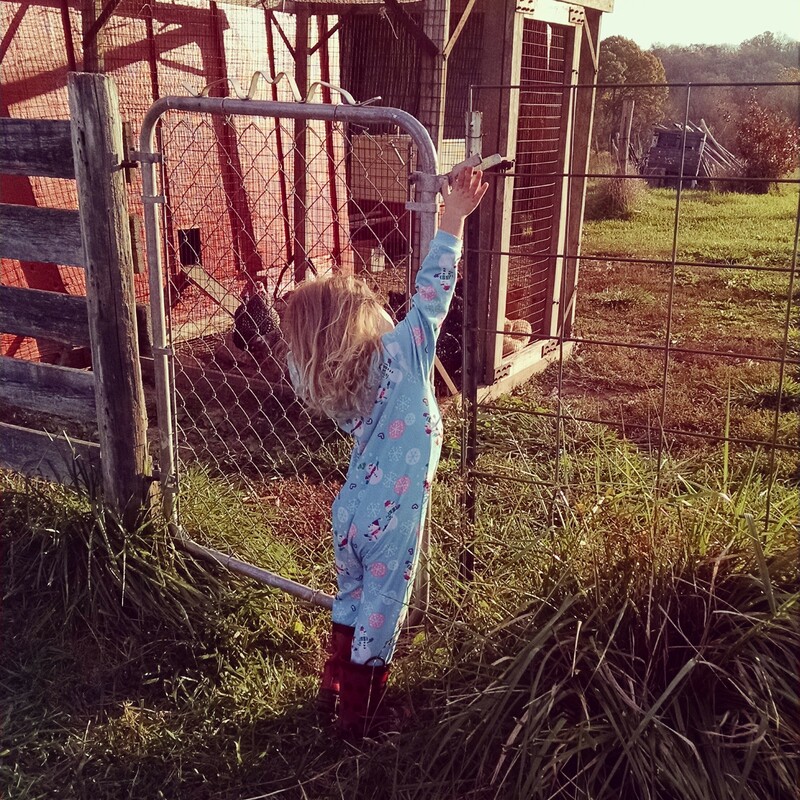 “The Princess Farmer” should be turned into a children’s book…no, seriously!